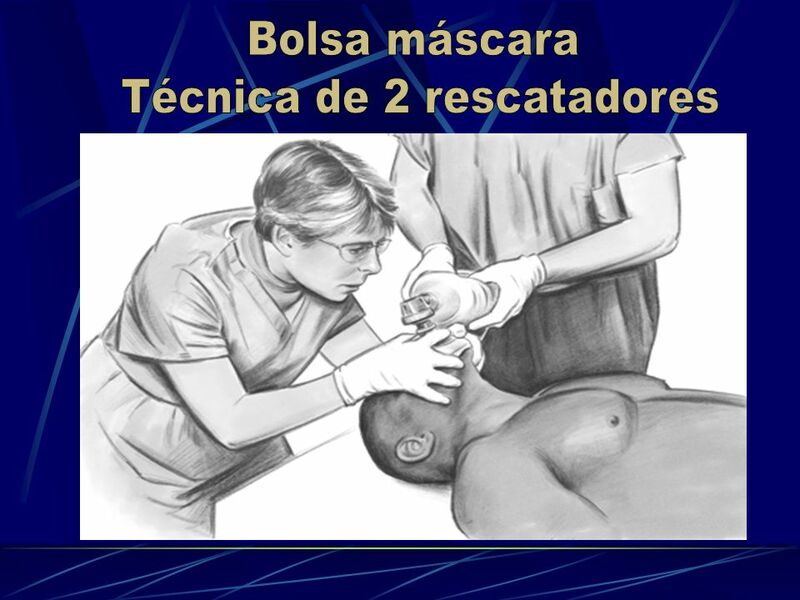 2 Muerte Súbita Principal causa de muerte en US. 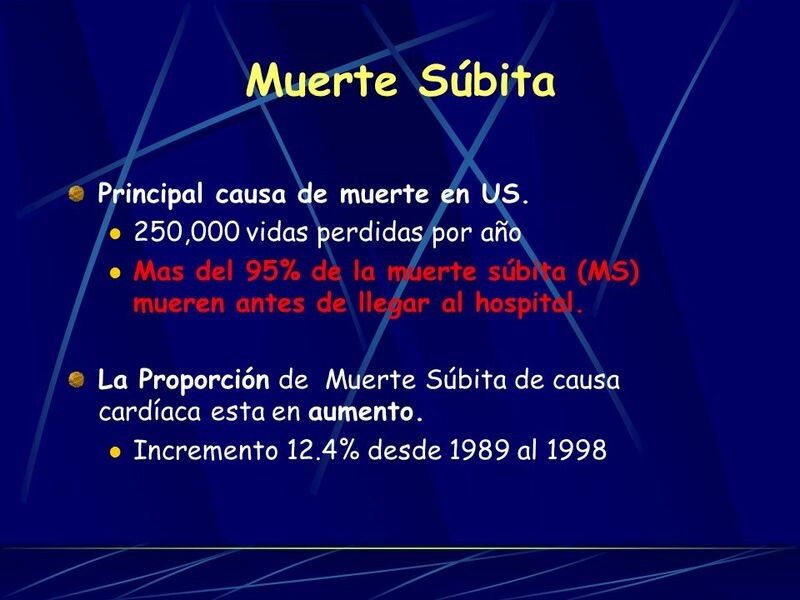 250,000 vidas perdidas por año Mas del 95% de la muerte súbita (MS) mueren antes de llegar al hospital. 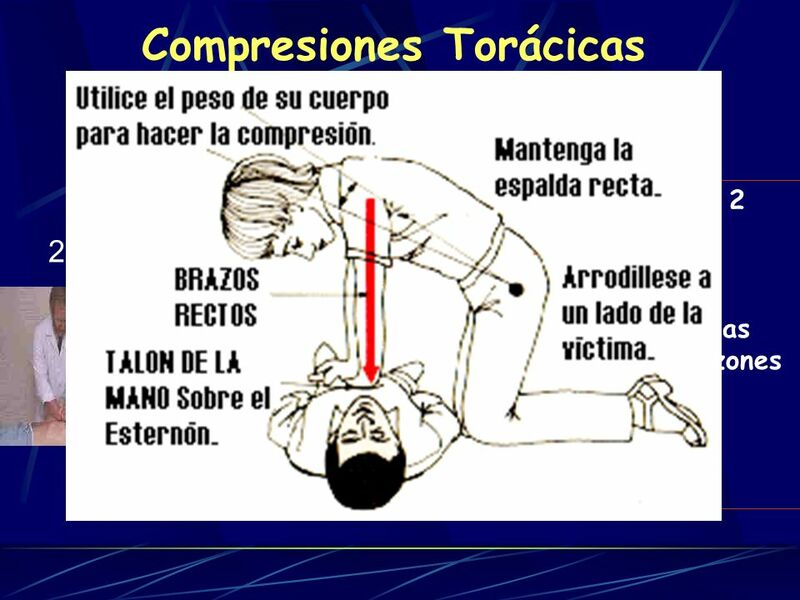 La Proporción de Muerte Súbita de causa cardíaca esta en aumento. 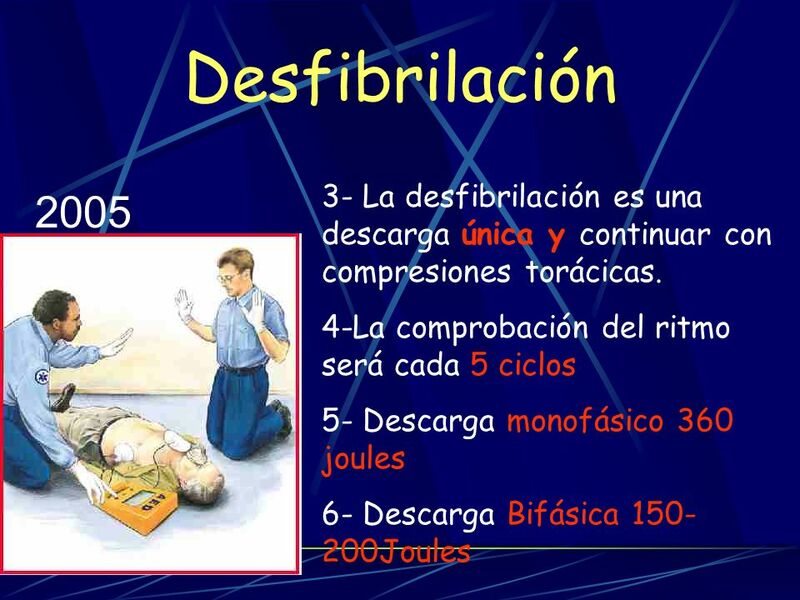 Incremento 12.4% desde 1989 al 1998 According to the American Heart Association (AHA), of the nearly 2,000,000 cardiovascular deaths each year, the total mention coronary heart disease (CHD) mortality is 460,000 (23%).1 Sudden cardiac arrest (SCA) is a leading cause of death in the United States, claiming approximately 250,000 lives each year. 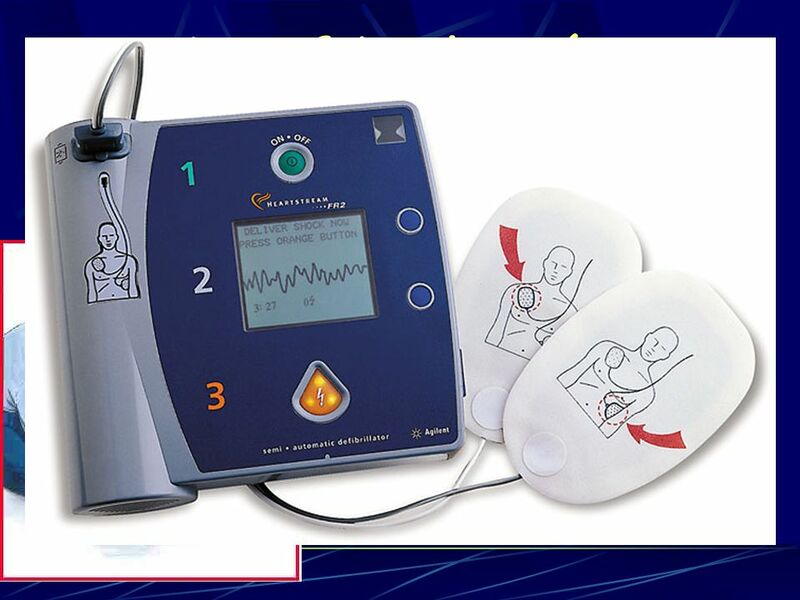 More than 95% of victims die before reaching the hospital largely because a defibrillator does not reach them in time.1 Zheng Z, et al. 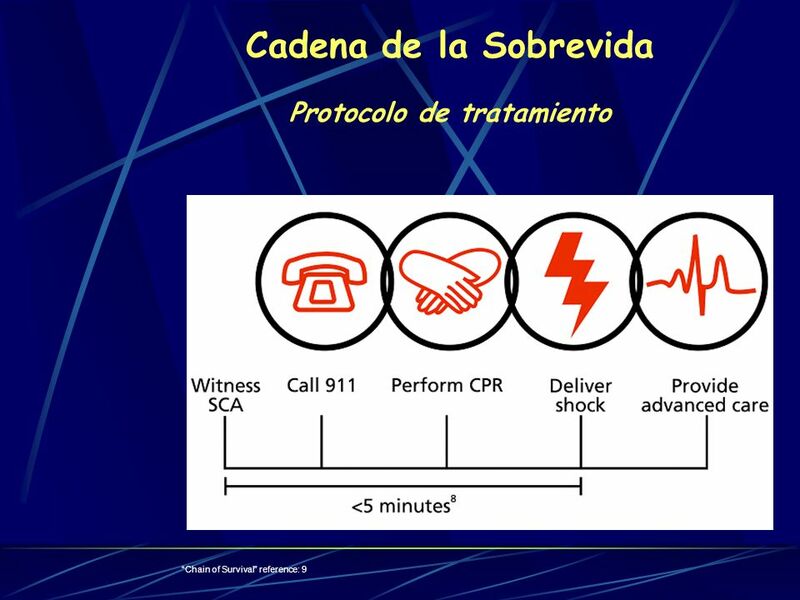 reviewed the mortality rates from 1989 to 1998 for SCA-related deaths and found that although age-adjusted rates for sudden cardiac death (SCD) were declining, SCD as a proportion of all cardiac deaths increased by 56.3% to 63.9%. 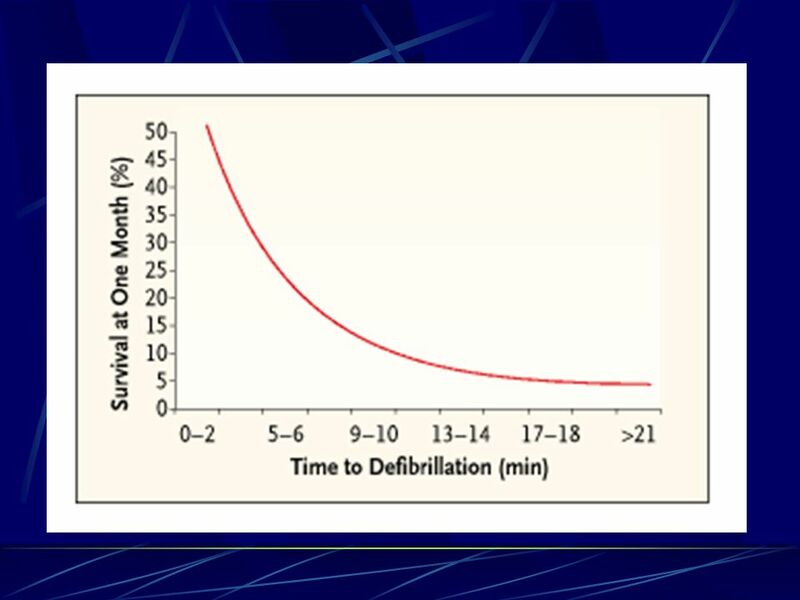 During the same time, age-specific death rates for SCA increased 21% among women aged years.2 The reasons behind these increases are not yet understood. 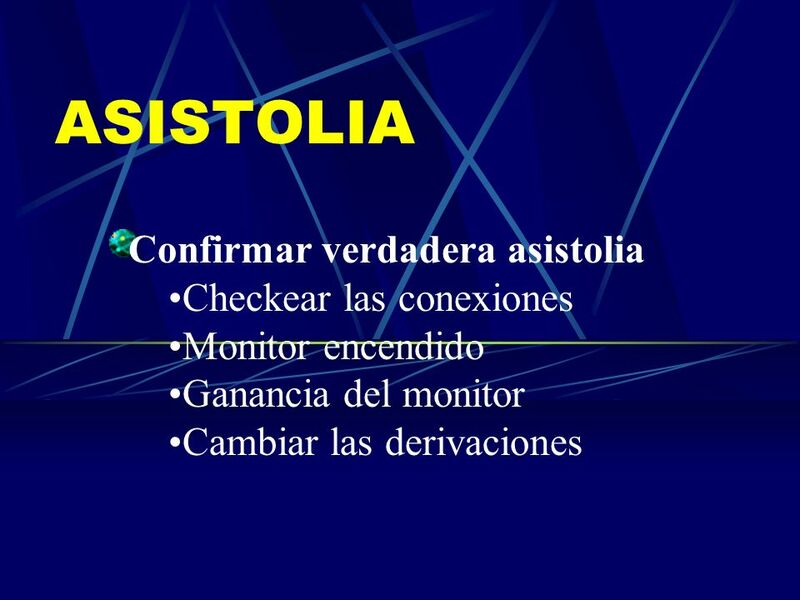 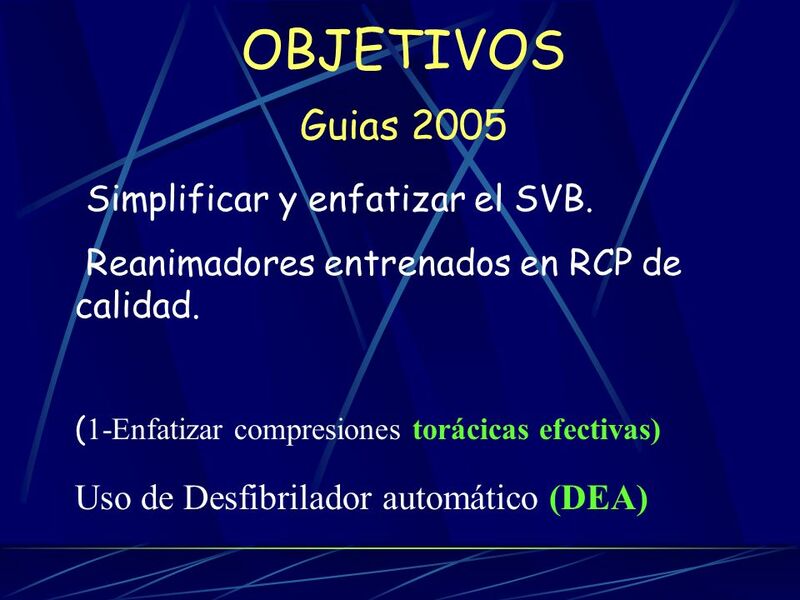 6 OBJETIVOS Guias 2005 Simplificar y enfatizar el SVB. 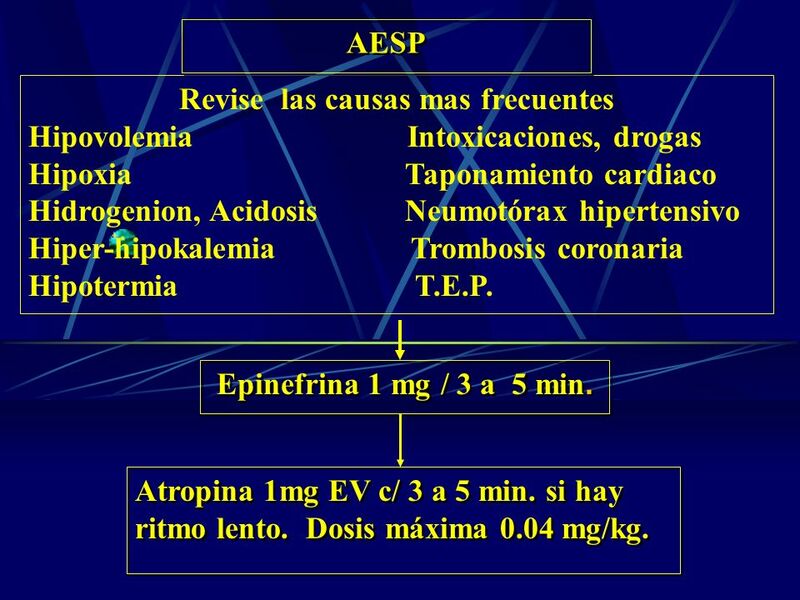 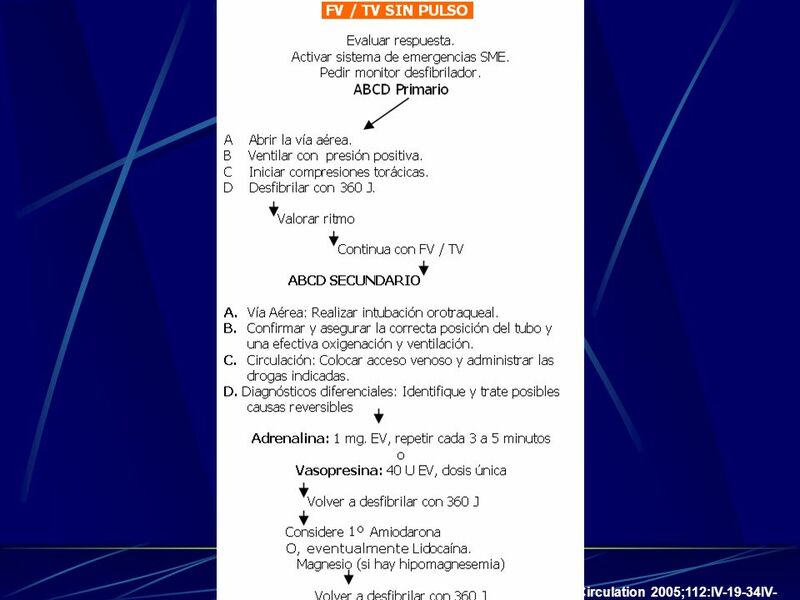 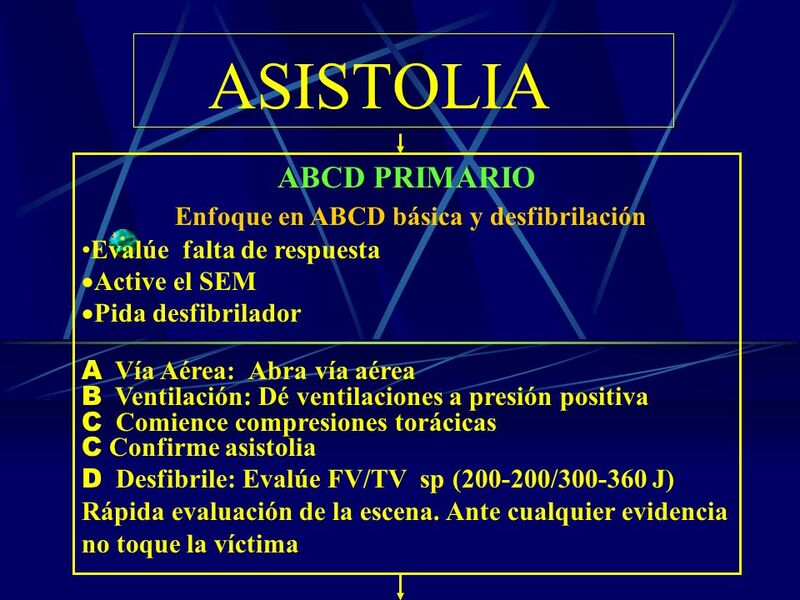 AESP Revise las causas mas frecuentes Hipovolemia Intoxicaciones, drogas Hipoxia Taponamiento cardiaco Hidrogenion, Acidosis Neumotórax hipertensivo Hiper-hipokalemia Trombosis coronaria Hipotermia T.E.P. 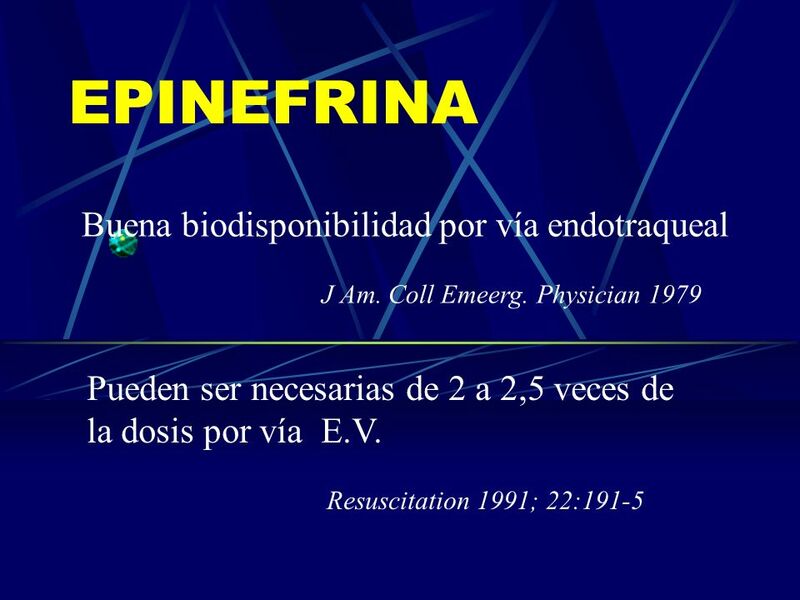 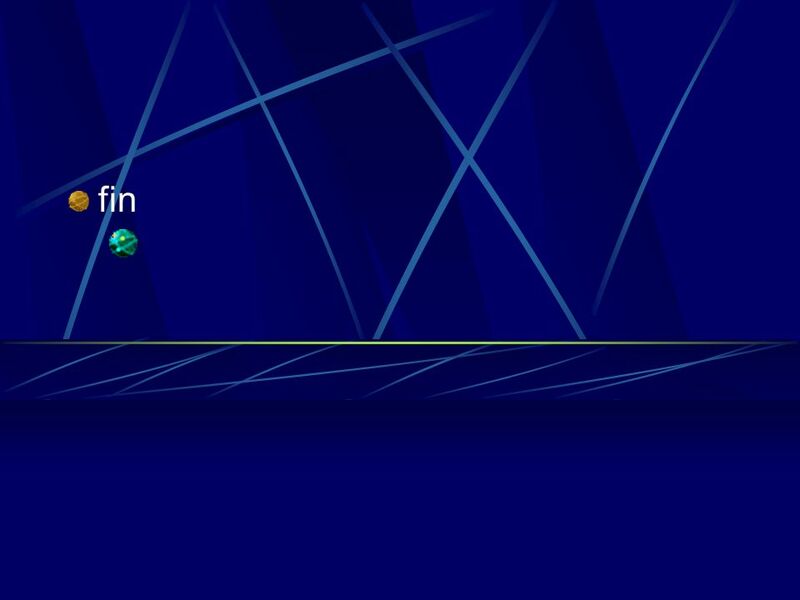 Epinefrina 1 mg / 3 a 5 min. 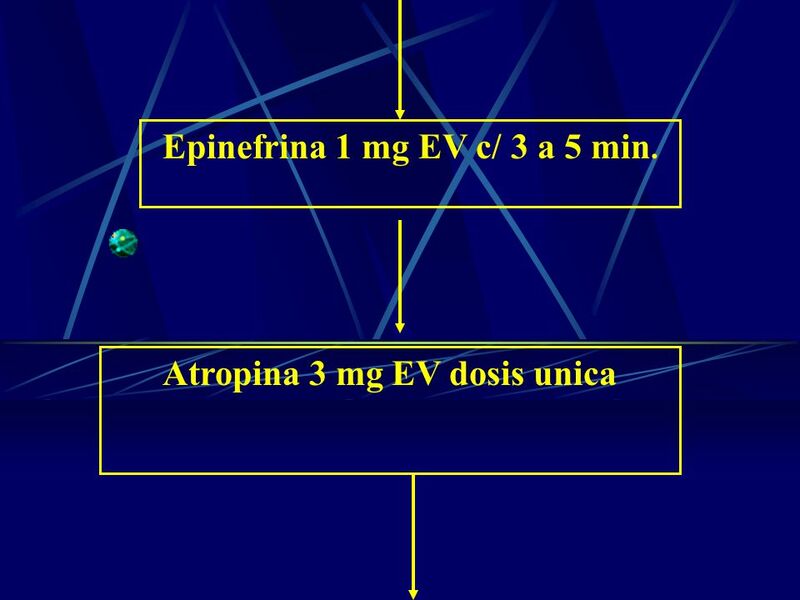 Atropina 1mg EV c/ 3 a 5 min. 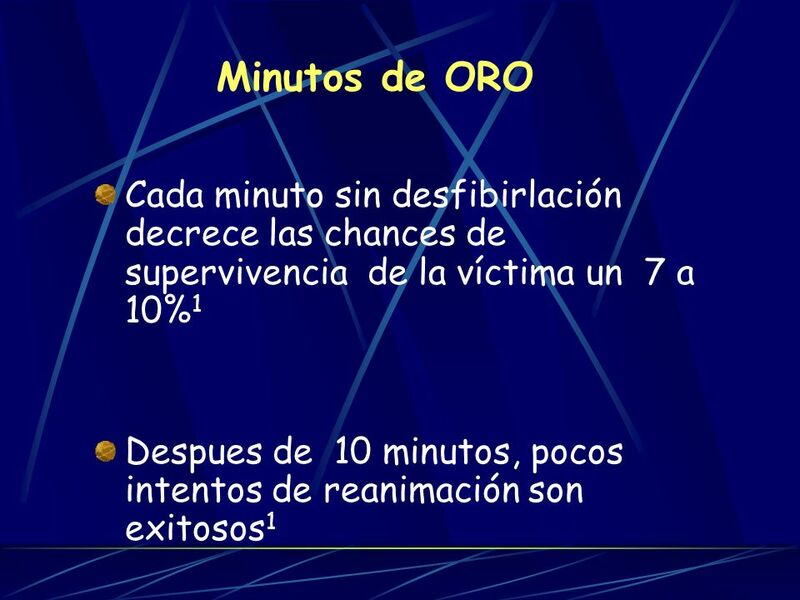 si hay ritmo lento. 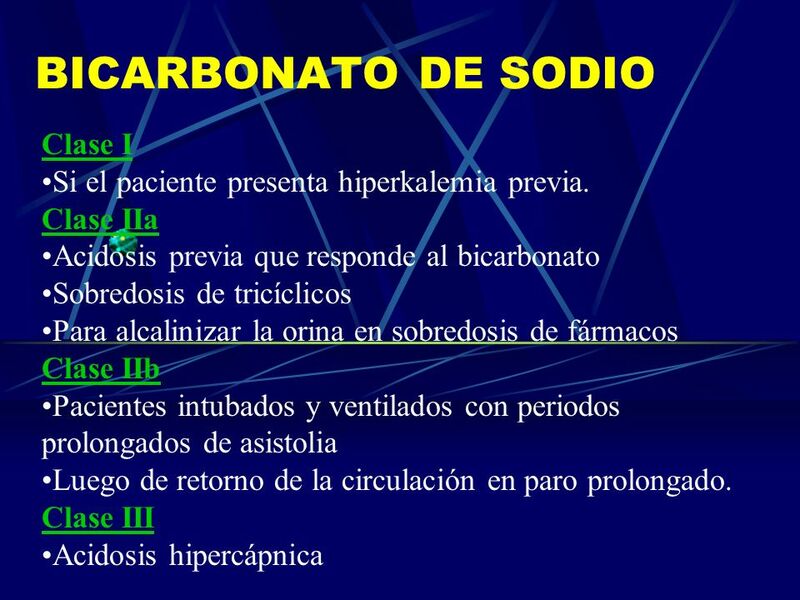 Dosis máxima 0.04 mg/kg. 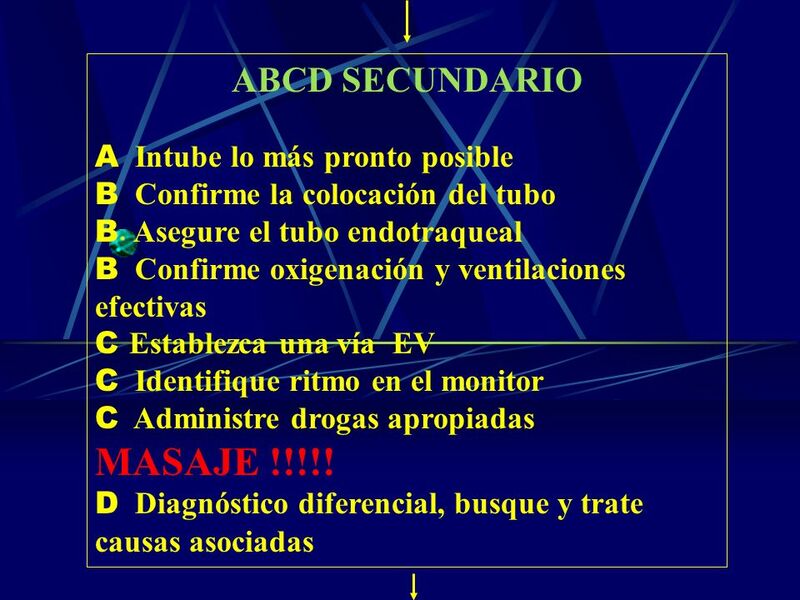 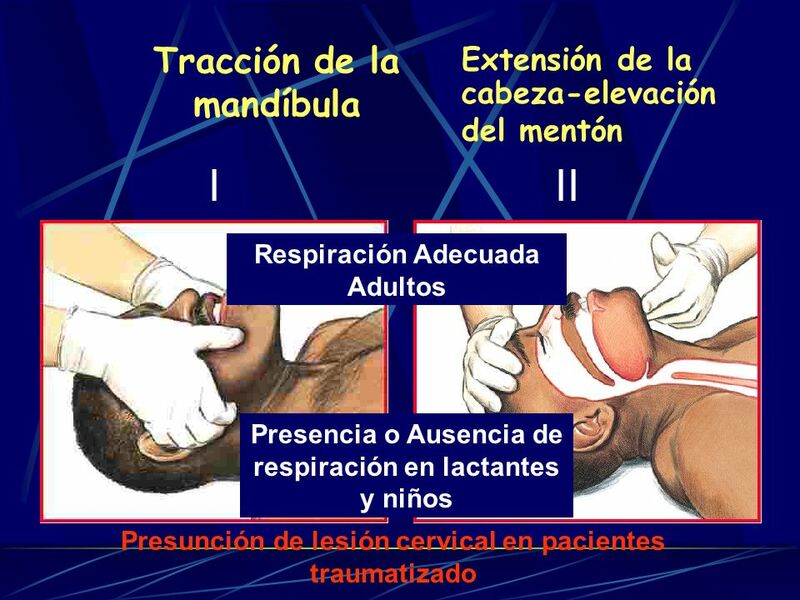 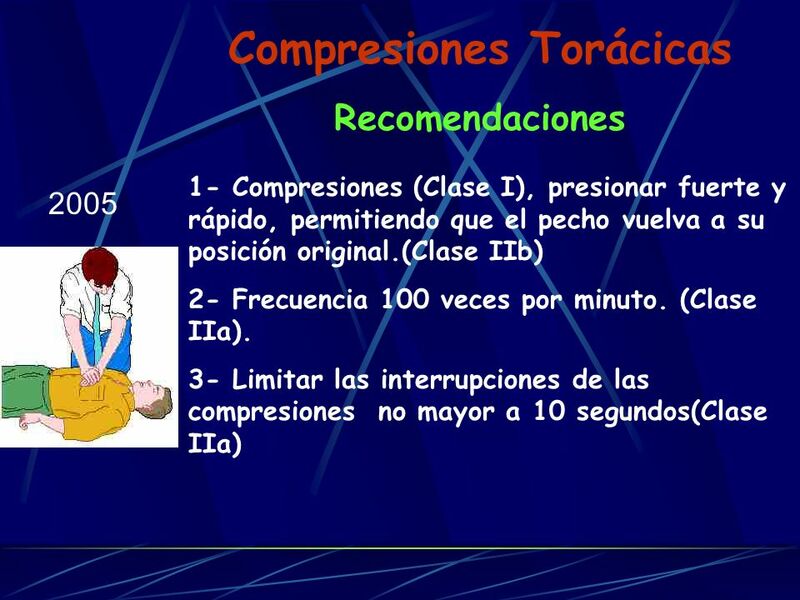 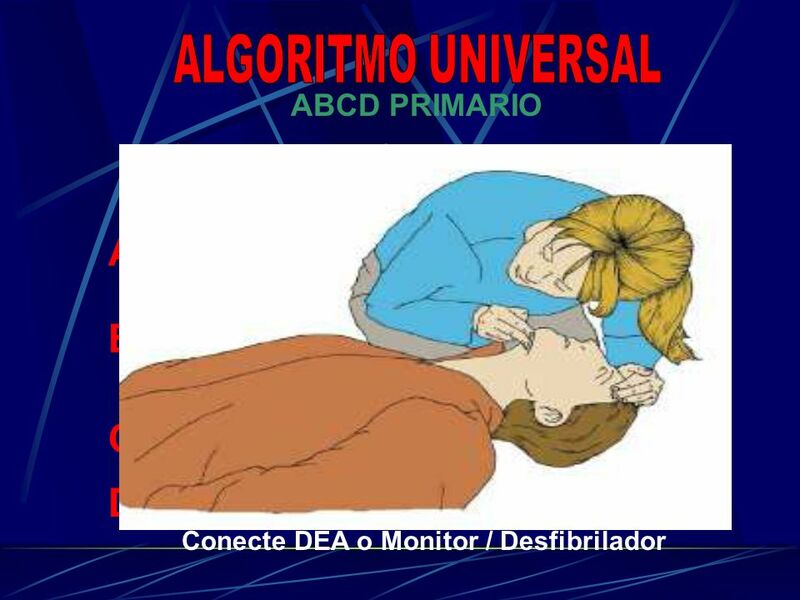 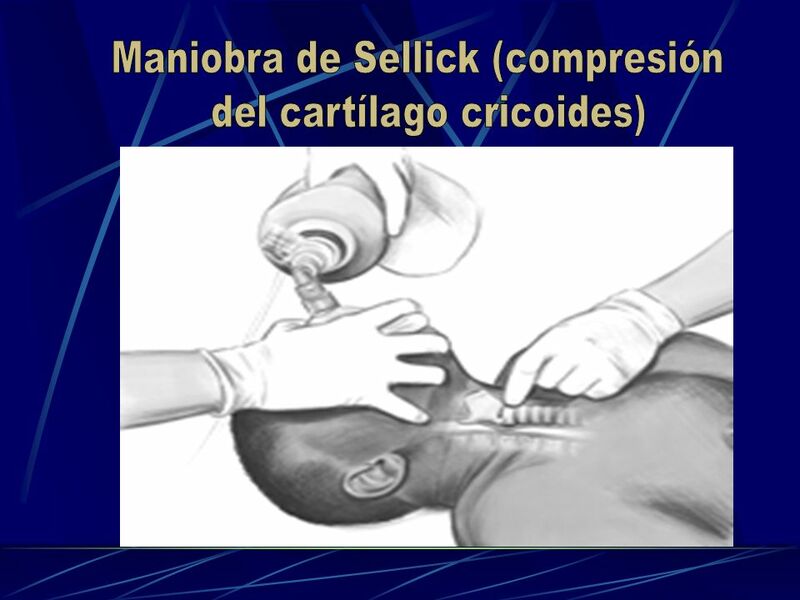 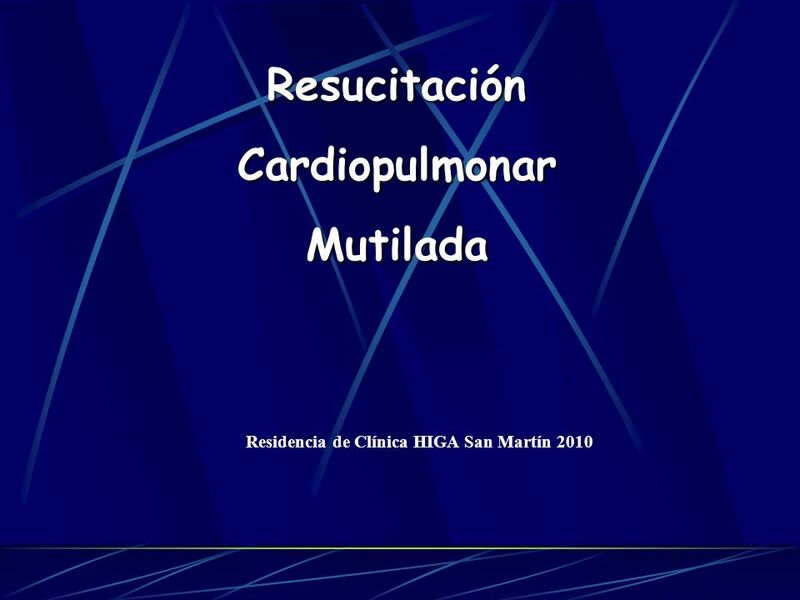 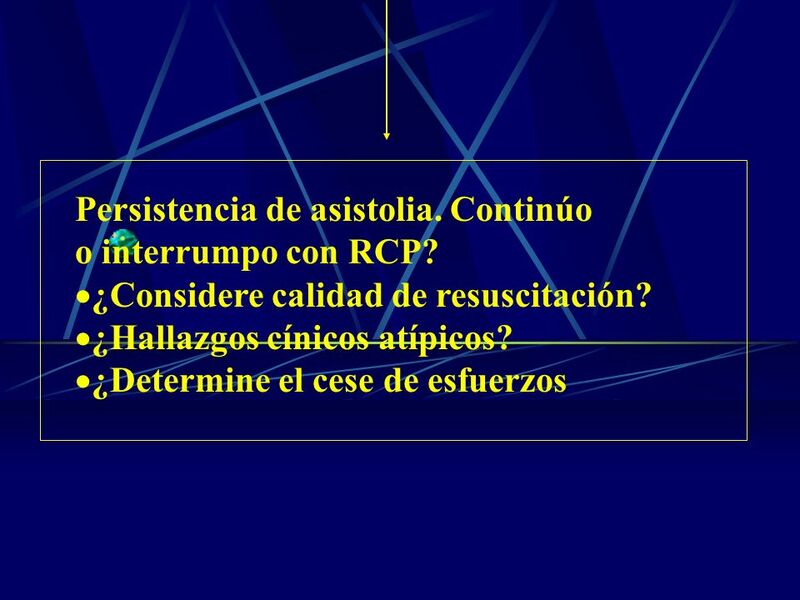 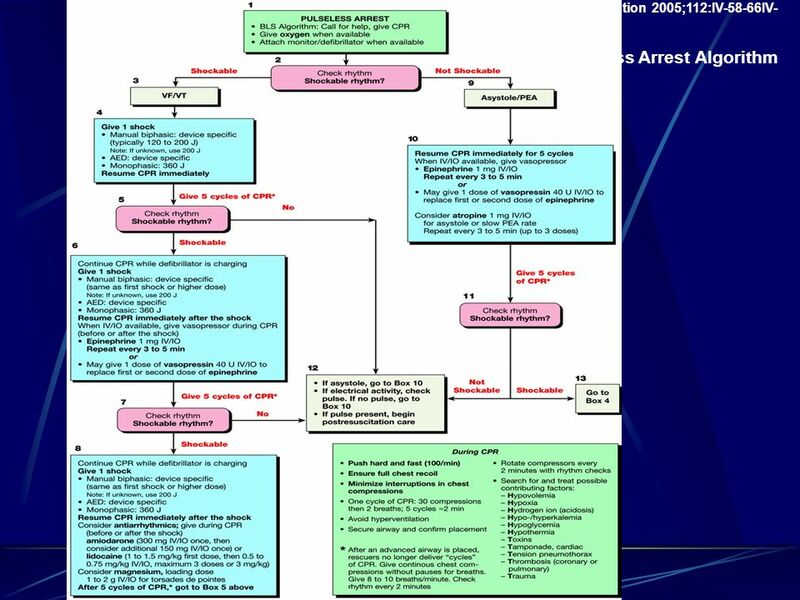 Descargar ppt "Residencia de Clínica HIGA San Martín 2010"
REANIMACIÓN CARDIOCEREBROPULMONAR ¿QUÉ HAY DE NUEVO? El ABC de la Vida A	VÍA AÉREA B	BUENA RESPIRACIÓN C	CIRCULACIÓN.